Summer is fast approaching, and all of us students are starting to get really stir-crazy being at school. With a little under 15 days left, summer can’t come soon enough. This Sunday though, was Mother’s day. Just as a note, I made a different dessert for my mom, but since that is the Daring Baker’s challenge I can’t post that until the 27th. Oh, and I stumbled upon this great new website: Luvocracy. It’s a shopping site that finds the lowest prices for you, along with their own catalogue of interesting items from around the Internet. I would highly suggest checking it out. This week I settled for individual cakes that are indeed quite labor intensive. But they are very good if your willing to put in the work! Whip the whole eggs with the sugar and the vanilla sugar until they change color and their volume triples. Sift together the flour and the cocoa powder. Gradually add the flour and cocoa mix to the egg batter and gently fold them in, from bottom to top. Butter and flour a rectangular pan (28x20cm) and pour the batter in. Bake the sponge cake in the preheated oven at a temperature of 170°C for about 20-25 minutes. Click on this link to get some useful tips for a successful sponge cake. Remove the sponge cake from the oven, let it cool for a bit in the pan, then flip it over on a rack and let it cool for completely. Pour the double cream in a saucepan and add the butter. Simmer on very low heat and make sure it doesn’t get to a boil! When the mixture gets very hot, remove from heat and add the chocolate cut into very small pieces and the rum. Stir until the chocolate is completely melted then let the mixture cool down for about 10 minutes. After 10 minutes, start to whip it until it turns into a lightly colored frosting. You will need approximately 10 to 15 minutes until it thickens. After it is cool enough, leave it on the counter until you start putting the cakes together. In a small saucepan, mix the water and the fructose and simmer on low heat. When the fructose is completely dissolved, put out the heat, add the brandy and the vanilla extract and cover the saucepan with a lid. Let the syrup cool down. Make sure to prepare the icing after you have assembled the cakes. In a small saucepan add the butter cut into pieces, the sugar, the milk and the cocoa powder. Simmer on very low heat. When the butter and the sugar are completely melted, put out the heat and add one sheet of gelatin which you’ve previously soaked in cold water for about ten minutes. The gelatin should be well drained before added into the icing. Be careful not to let the icing reach to a boil! Whisk the icing for about 3 or 4 minutes. The more you whisk it, the shinier it will be. Let it cool. (I used ready-made marzipan in this recipe.) Knead the marzipan for a bit to soften it, then roll it out in a sheet with a thickness of 1,5 cm on a surface lightly powdered with icing sugar. Cut out 6 circles with a large cookie cutter. Wrap some baking paper around a rolling pin. Melt the chocolate in a double boiler or in the microwave, let it cool for a bit (about 5 minutes), then pour it in a piping bag and pipe strands of chocolate on the rolling pin. Put the rolling pin in the freezer for 10-15 minutes, then gently peel off the chocolate crescents. Cut the sponge cake into circles using cake ring. Cut each cake into three layers. Place the first sponge cake layer in the cake ring, moisten it with 1 or 2 tablespoons of syrup, add some ganache filling, place the second sponge cake layer, moisten it, add the marzipan sheet and then the last sponge cake layer which should be very lightly moistened. Put the cakes in the oven and start making the icing as mentioned above. When the icing is cold, remove the cakes from the rings and place them on a rack. Don’t forget to protect your working area by placing a tray underneath the rack. Ladle the icing onto the cakes and make sure it perfectly covers the sides of the cakes. 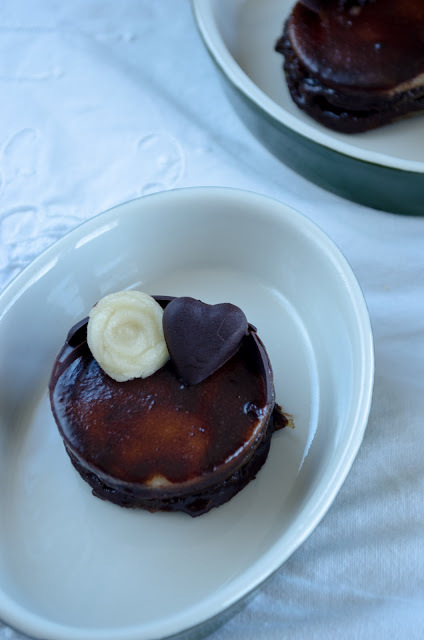 Let them set for about 30 minutes then dress the sides in chocolate flakes and decorate with chocolate crescents and sugar hearts. You can serve them immediately or keep them in the fridge. If you want to serve them later, make sure to take them out of the fridge 30 minutes before serving.